Normally I absolutely despise talking about any kind of Autumn-Winter collection when it's not even mid-July. But I make an exception this time because a/ given the weather, it's virtually Autumn already and b/ this is Illamasqua, ladies, and I always find the announcement of their new collections so exciting! I was actually invited to come and discover this collection a couple of weeks ago, but not living in the UK, I couldn't arrange a mini-trip to London on short notice and was unable to attend, which I'm even more sad about now that I've seen everything that was introduced there! With Generation Q, Illamasqua is blowing away these rules and telling us to wear what we want to wear. This is the end of putting a sell-by date on beauty, self-expression and creativity. This is, of course, perfectly illustrated by this makeup created by Alex Box on the lovely Evelyn, 72 years old model for this collection. "I am originally a country gal, born in Dorset in May 1940. I was not academic or sporty at school and would gaze out of the window and dream of the bright lights and big cities. I have always loved make-up; from a small girl using Mother's lipstick. I loved those beautiful women in the 1930s and 1940s films and tried to copy the looks. I get such pleasure every day from just putting my face on, and even more so now - thank you, Illamasqua!" Isn't she just looking radiant and gorgeous? I do wish I will sill wear makeup that proudly and confidently when I am 72! As a "slightly older than average beauty blogger" (understand: in my mid 30's), I do notice how younger beauty bloggers and people in general strongly associate age with issue. I cringe every time I read someone telling they " will gladly consider botox when they turn 35 or something". Well look at my pics on this blog and tell me where I should have botox now? It's high time a company stands up and talks about age as something that's not a desease but rather a normal and process that can go hand in hand with beauty! The products in this collection all look absolutely stunning. Two new eyeshadow palettes are offering a combination of 2 powder eyeshadows, one cream pigment and one pressed pure pigment. The shades look perfect for Fall, definitely suitable for dramatic looks as well as more daytime ones (if you do make a different between your daytime and nighttime makeup, of course). There is a new shimmery blusher in the range, and if it's as good as my beloved Ambition, it will definitely be a must have. The nails and lip products also look fabulous and I do think they will look good on anyone. I am definitely looking forward to discovering more visuals from this collection and buying some of the products as soon as they launch in September! I do think the chance is high I will get most of the products, at least the 2 palettes and one blush for sure! What do you think of this collection? 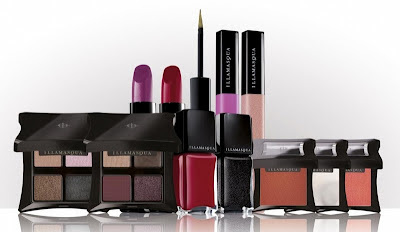 And of Illamasqua's vision on beauty and age? I love the concept, but to be honest the look in the promo shots is very much "old lady makeup" to me...I know Illa is into strong looks, but I wish a brand would do a collection aimed at helping mature women do natural, glowing, pretty makeup. That's by far the most popular look and one that's harder to do if you're older sometimes. mmh I think if you can go super dramatic, you can go lighter, while the opposite is not necessarily true! But I get what you mean. I think she looks beautiful and the colours are really eye-catching. Looking forward to this one. First, you don't need botox. Let's give those girls a chance to discover that 30s are awesome and beautiful. And so will be 40s and 50s and... well, you know what I mean. Second, I LOVE this collection. Those palettes are to die for. Have a great weekend, M! Don't you DARE get botox. Botox where? You're lovely. And I'm super excited for this collection! I'm lucky to live in cosmopolitan places where the sight of fabulously turned-out and imaginatively made-up older women (by which *I* mean 70+) is not a rare one.